400 pages | 80 B/W Illus. Chaos is the idea that a system will produce very different long-term behaviors when the initial conditions are perturbed only slightly. Chaos is used for novel, time- or energy-critical interdisciplinary applications. Examples include high-performance circuits and devices, liquid mixing, chemical reactions, biological systems, crisis management, secure information processing, and critical decision-making in politics, economics, as well as military applications, etc. 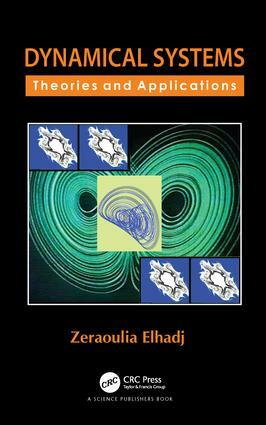 This book presents the latest investigations in the theory of chaotic systems and their dynamics. The book covers some theoretical aspects of the subject arising in the study of both discrete and continuous-time chaotic dynamical systems. This book presents the state-of-the-art of the more advanced studies of chaotic dynamical systems. Zeraoulia Elhadj, born on February 23, 1976, in Yabous, Khenchela, Algeria, received his B.S. degree in mathematics from the Institute of Mathematics (University of Batna, Batna, Algeria) in 1998 and a Ph.D. degree in mathematics from the University of Constantine, Constantine, Algeria, in 2006. He joined the Department of Mathematics, University of Tébessa, Tébessa, Algeria, in 2001 as a Research Associate, and in the same year, Elhadj became an Assistant Professor. Since 2001, he has been teaching undergraduate and graduate courses on applied mathematics. His primary research interests include bifurcations and chaos. He has authored or coauthored more than 150 journal and conference papers and 15 books. He is the Editor-in-Chief of the Annual Review of Chaos Theory, Bifurcations and Dynamical Systems Journal.